We have earned our reputation because of Excellent Customer Service, Competitive Prices, On-Time Delivery. "We deliver quality just in time"
We have an excellent team of Highly Qualified Engineers who has engineered our ptoducts to withstand tough applications and strive to make continuous improvements using advanced CAD/CAM systems. For low pressure services the conical and spherical faces of the male and female subs respectively form an effective metal to metal seal. For medium pressures a Nitrile O-Ring is additionally provided in the male sub (using the metal to metal as a zero clearance extrusin gap). 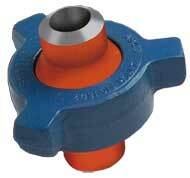 For high pressure a Lip type seal ring of Nitrile with a metal to metal backup is provided. The seals protect the secondary metal from corrosion and also limit fluid flow turbulence. Viton seals are provided for sour gas service. Other elastomers are available on special request.